How to prevent radicalisation of young people? 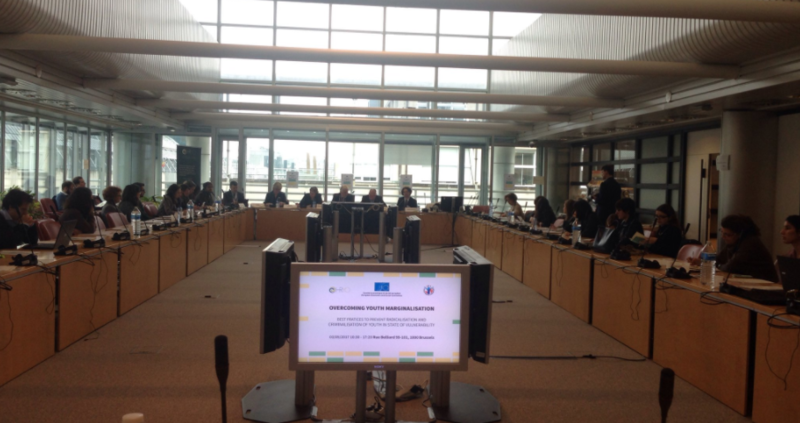 The ‘Overcoming Youth Marginalisation’ conference, organised by Human Rights Youth Organisation, brought together legal experts, policymakers and front-line practitioners to address the issue of young Europeans embracing violent extremism. In September 2015, Tamimount Essaide, Director of the Maison de Quartier St Antoine (MQSA) in Brussels, met Saliha Ben Ali, a mother whose 19-year-old son died in Syria after joining ISIL. Mrs Ben Ali is the founder of Society Against Violent Extremism. Together with MQSA and Women Without Borders they launched the Mother’s School as a tool to understand and combat the problem of young people embracing extremism. ‘We receive calls from mothers concerned about the future of their children, and mothers can be the first to notice sadness or isolation in a child, so they can play a role as regards early warning and safeguarding their children’ explained Tamimount. During a 15-week period at the Mother’s School, the participants get a better understanding of their children’s environment, learn how to carry out intelligent prevention and strengthen the emotional ties between parents and children’. This initiative exemplifies an idea shared by all conference speakers: the first battleground to overcome youth marginalisation and prevent violent radicalisation is the local area. A firm defender of the local approach is Bart Somers, the mayor of the city of Mechelen in Belgium and the winner of the World Mayor Prize 2016. He started by addressing two inconvenient truths: ‘first, nearly 4 200 young Europeans have joined ISIL and if the number of violent radicalised young people joining ISIL keeps going up it will be impossible for security services to monitor them. Secondly, de-radicalisation is very difficult, as it needs a lot of time and money and success is not guaranteed’. That’s why he advocates the prevention and overcoming of marginalisation. ‘We don’t need more police or special laws. The first thing to do is have an inclusive policy at the local level, you need to create security in your city, don’t allow neighbourhoods to be without services, with criminals as role models’ stated the mayor of Mechelen. He also pointed out that even if we claim to live in a multicultural society, ‘in many cities people don’t live with each other but next to each other, in archipelagos of monocultural societies’. He stressed the importance of having mixed schools, sports clubs, and youth clubs. In Mechelen, there’s a football club with young players from different cultural backgrounds. However, besides playing football, they do homework together and if they receive bad marks at school they can’t play the following week. There’s also a boxing club, founded by an ex-drugs dealer, that aims to help the city’s most vulnerable young people. They learn how to box on the condition that they keep a good record at school and if they are caught fighting once on the street they are kicked out of the club. For Caterina Chinnici, Co-Chair of the European Parliament Intergroup on Children’s Rights ‘the combat against marginalisation and discrimination should be the first priority at European level. Prevention and reintegration has to be done through education’. This is not a new approach, as she remembers how her father Rocco Chinnici, a judge who was assassinated in 1983 by the mafia, ‘was an innovator in criminal law, as he was the first magistrate to meet and work with young people, as a tool to prevent radicalisation’. Adélaide Vanhove, from the International Juvenile Justice Observatory, warned: ‘Prison is the worst place for young people with problems, because there’s a risk that they will become radicalised and get recruited while in jail’. She remarked that ‘little consideration has been given to the fact that some of the suspected or alleged terrorists could be children or underage juveniles. There are no policies tailored to children in the field of counter- terrorism in most EU Member States’. Vanhove believes that ‘repressive measures are no longer sufficient; they may even have the opposite effect’. She urged the adoption of a new strategy based on prevention. This is the reason why the Observatory launched the project ‘The prevention of juvenile radicalisation: Promotion of the use of alternatives to detention through judicial training’ (2016-2018). Its aim is to share good practice between judges, prosecutors, court officers, lawyers, mediators and policymakers. They will create a manual and an e-learning training course to help judiciary workers tackle the issue of radicalisation in detention and study alternatives to detention, including community and family-based approaches to de-radicalisation. In countering radicalisation, volunteers also have a role to play. As the director of the European Volunteer Centre (CEV) Gabriella Civico put it, ‘negative stereotypes fuel hate-filled action and volunteering has the power to break stereotypes and promote understanding and tolerance of differences, thus preventing extremism’. She stressed the fact that volunteering builds community and resilience, and that it occupies the space where strategies for prevention can be implemented. However, Civico was also critical of traditional civil society, which ‘is not addressing radicalisation and countering extremist ideology, due to lack of the necessary expertise and fear of a backlash from society, which could see it as being soft on crime, and therefore a risk of losing their funding’.